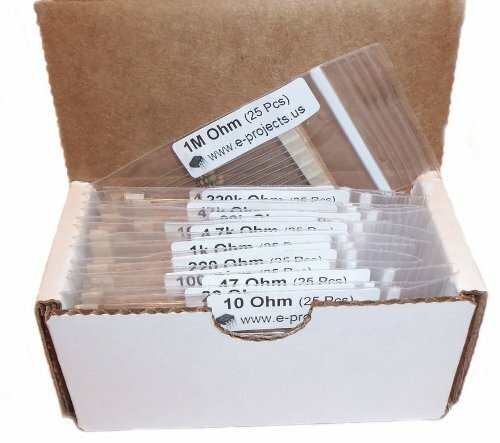 100 each 220 ohm resistors. 1/2 watt. 5% tolerance. Flame retardant coating. Lead free & RoHS Compliant. Cut tape packaging. 25 each 220 ohm resistors. 1/4 watt. 5% tolerance. Flame retardant coating. Lead free & RoHS Compliant. Cut tape packaging. Package of 100 pieces of a single value. 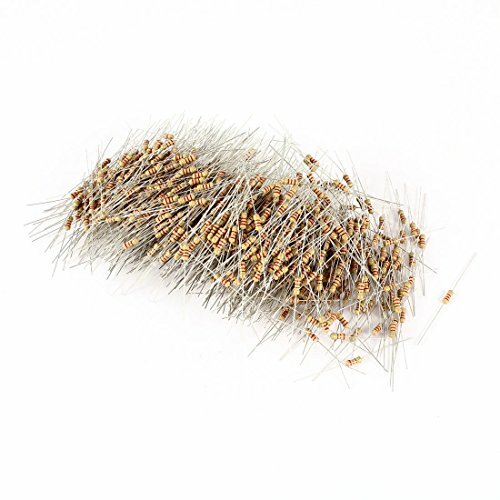 Includes qty 100 1/4W, 5% tolerance through-hole resistors . Used for building electronics or prototype circuits. 25 each 220 ohm resistors. 1/2 watt. 5% tolerance. Flame retardant coating. Lead free & RoHS Compliant. Cut tape packaging. Stable performance, extensive resistance, small size, high operating temperature and high ultimate voltage. 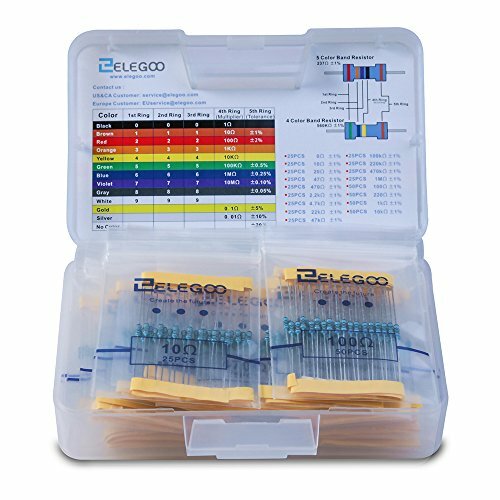 Each resistor kit contains 400 total resistors. 25 each of the following 16 standard values: 10, 22, 47, 100, 220, 470, 1k, 2.2k, 4.7k, 10k, 22k, 47k, 100k, 220k, 470k, and 1M ohm. 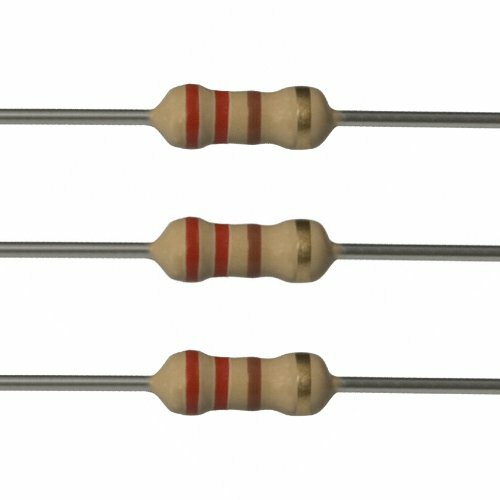 Resistors are 1/4 watt, 5% tolerance, carbon film resistors. 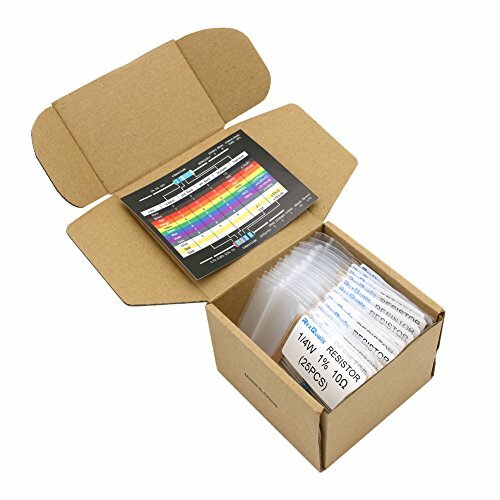 Each value is individually bagged, labeled and packaged in a reusable box. This is the perfect starter kit for any electronics hobbyist. 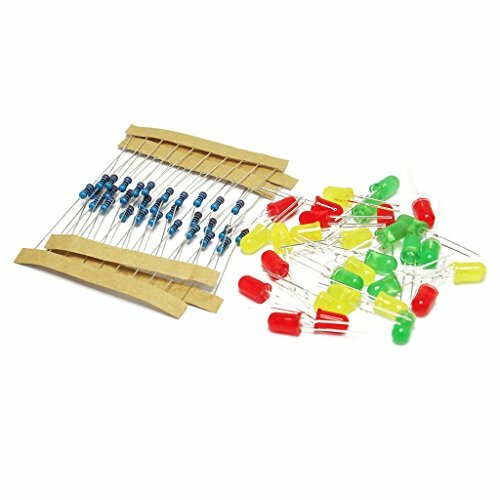 Features: 220 ohm resistance, 5W rating power, 700V withstand voltage, +/-5 percent resistance tolerance, 4-band color Code, metal oxide film resistors. Axial lead through hole mounting for easy installation. Low noise, stable performance, high frequency and high accuracy. Metal oxide film resistors result in a higher operating temperature and greater stability/reliability than metal film resistors, and are used in applications with high endurance demands.